I am presently propagating and sowing ready for the new season, many new plants that have been trialled over the last few years in the garden at the croft will be added to the Nursery catalogue over the coming months and I look forward to introducing them to you this year. 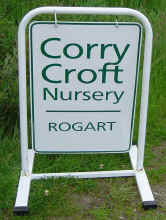 ** Please note that I attend the Dornoch Community Market on certain Wednesdays between May and September, 9.30 - 2pm. The dates and times for these Markets can be found on the Dornoch and District Community Association (DADCA) website. To check whether the Nursery is open before embarking on a journey, or for appointments outwith the above opening hours, please telephone Sarah Whealing: (01408) 641469.